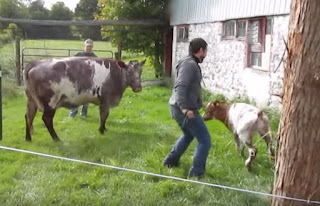 Cows Have Started to Arrive at Govardhana Farms ~ The Toronto Hare Krishna Temple! As many of our regular congregation members know, two young devotees from our community - Fil and Sukhayanti devi dasi - have started Govardhana Farms! Aside from their organic vegetable program, wherein organic produce was sold to our devotee community this past summer, they are actively working on starting their cow protection program. The first cows have arrived to Govardhana Farms and there are some very nice videos that we're sure you would love to see. Check them out below. Also, don't forget! The Toronto Hare Krishna Temple has sponsored a cow (set to arrive to the farm very soon) which will be saved from slaughter and we are asking you to help us name the cow!